"I'm as partisan as they get!" Updated Wednesday, June 27th, 2012! Earlier this week the Supreme Court released their rulings on a couple court cases. To get to the point, Justice Scalia made some puzzling remarks regarding the cases. Not to get into too much detail, there were too cases in particular - Montana's defiance against Citizens United citing historical corruption situations that led rise to the state's finance reform and the Arizona immigration case. While Montana's nearly century-old state law was struck down by the court, with Scalia in the majority, Scalia was in the minority for the latter case. One thing that was interesting is that Scalia argued for state sovereignty in one case but completely ignored it in the other case. The other thing that is interesting is that in Scalia's dissenting remarks, he attacked the administration, more specifically President Obama. Scalia claimed that the federal government's argument that harsh immigration policies would be a drain on resources is null and void with the president's recent executive order that will prioritize immigration enforcement and exempt certain youths from deportation. Scalia argued that non-enforcement would cost more time and money than enforcement and so the federal government had no reason to argue their case. "The husbanding of scarce enforcement resources can hardly be the justification for this [policy change], since those resources will be eaten up by the considerable administrative cost of conducting the nonenforcement program, which will require as many as 1.4 million background checks and biennial rulings on requests for dispensation," said Scalia, referring to the number of undocumented immigrants estimated to benefit from the secretary of homeland security's announcement on June 15. "The President has said that the new program is 'the right thing to do' in light of Congress's failure to pass the Administration's proposed revision of the immigration laws. Perhaps it is, though Arizona may not think so," said Scalia. "But to say, as the Court does, that Arizona contradicts federal law by enforcing applications of federal immigration law that the President declines to enforce boggles the mind." 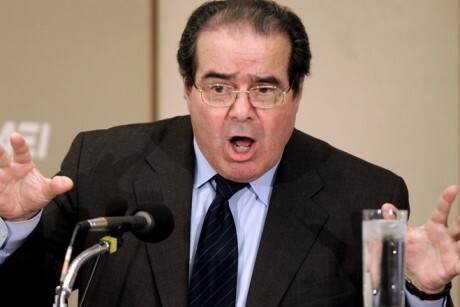 What is interesting about Scalia's dissenting opinion? The justices' opinions were pretty much determined in late April. Then the opinion writing gets started. More than a month later Scalia includes the above attack against the administration to prove the federal government didn't know what they were talking about. Isn't it interesting that for a case that was already determined Scalia pulls a news headline into his opinion, going beyond the scope of the questions at hand. Obama's executive order was not part of the argument as the justices heard it (being it occurred over one month from when he supposedly made up his mind) yet Scalia has decided to inject that headline into his opinion for no apparent reason than to show his partisan leanings and attack the president. He offers no facts in attacking the president - only assumptions. Consider this fact - Scalia cites 1.4 million background checks and biennial rulings for requests for dispensation. Assuming Scalia's numbers are correct, what would happen to those individuals under active enforcement? Where would these individuals be detained, who would remove them from the country, and who would pay the final bill? "Since the late 1990’s, the number of people held in immigration detention has exploded. On any given day, ICE detains over 33,000 immigrants; this is more than triple the number of people detained in 1996. In the last 5 years alone, the annual number of immigrants detained and the costs of detaining them has doubled: in 2009, 383,524 immigrants were detained, costing taxpayers $1.7 billion at an average of $122 a day per bed. Nearly 2.5 million individuals have passed through immigration detention facilities since 2003." Now remember, Scalia only cites the number of immigrants that would be affected by Obama's executive order. Some sources list the number of illegal immigrants in this country to be over 10 million. If every illegal immigrant were to be detained, the costs of detention alone would balloon to close to $50 billion. By comparison, the U.S. Immigration and Customs Enforcement (ICE) agency has an annual budget of around $5.7 billion. When only considering Scalia's 1.4 million, we are still talking about an increase in detention costs of about 400 percent, with detention exceeding the entire ICE budget by nearly double the amount. Considering Scalia's lack of concern with campaign finance reform and the flow of unlimited amounts of money to campaigns and shadow organizations, it is no wonder that Scalia cannot understand (or chooses not to understand) the "husbanding of scarce resources." The U.S. Supreme Court's decision upholding a piece of Arizona's controversial immigration law portends such a "huge" increase in policing for one department that the chief wondered Tuesday if his agency will be able to handle the workload. Just 70 miles from the Mexican border, the Tucson department may have to spend more than $10 million a year to book and jail up to 36,000 arrestees also suspected of being illegal immigrants -- a more than 7% increase to the agency's $130 million budget, Villaseñor said. The police chief said he wonders if his 950-officer agency has been dealt an "impossible mandate." The state law, SB 1070, allows citizens to sue his department or others if they fail to enforce federal immigration laws, the chief said.